Ok sooooo things didn’t go exactly to plan…. ok rewind, so I was set to wear my red skirt again with my red, white and gingham boater - LOVE!!!! but the top that I ordered swamped me with its ruffles as I’m so petite. So I took it back to the store to exchange it for another top. But then I fell head over heels with this dress. But after 24hours of crushing hard on this look I felt like the millinery was too busy as the dress is already so intricate in its mix of lace, embroidery and laces. So I literally did not sleep going through my favourite milliners spring collections in my mind when it dawned on me - I really feel that this needed some Kate Middleton understated halo action like at Prince Louis Christening and maybe I would do my usual drag queen makeup. Maybe I would listen to the wise words of Sarah McEwan and ground my outfit in elegance. Hmmm that sounds like a good idea. I loved the natural weave on the halo but for my outfit wanted something without the flowers. There was the slight flower and veiling factor but Debbie was so accommodating in removing them for me and it was ready to pick up at 3pm the day before the races. OK now the bag. I didn’t have the millinery so I couldn’t match it plus the dress had the prettiest shades of blue’s, green and mustard yellow that I wanted to highlight through accessories. However again with the busy dress I kept my earrings simple and elegant with pearls. Now I know what you are thinking I own a boutique and have a silly amount of bags to chose from why not wear one of those? but no I try not to wear what I stock as I don’t think thats right. Cue intense clutch shopping and NADA, NOTHING, ZILCH - BOTHER!!!! I asked my neighbour - babow! I looked everywhere I know I could get it delivered or pick it up in time - I came up stumps! Then I remembered trusty Melissa Barnes from Adorn had started renting out bags - maybe just maybe she was have something super cute I could rent because I sure can’t afford to buy Gucci!!!! And the fashion Goddess smiled on me and blessed me with this bad boy. In my classic rethink/overthik everything style I messaged Melissa to get her opinion and she liked it and hell if a Myer finalist likes it HOLLA I love it!!!!! It all started to come together and everything arrived on time and OMG can we just appreciate too my Daughters stunning custom made Holly Barker boater in shell blue with ice pink silk ties - super cute!!!!!!!!!!!!! It was a different race day for me though. 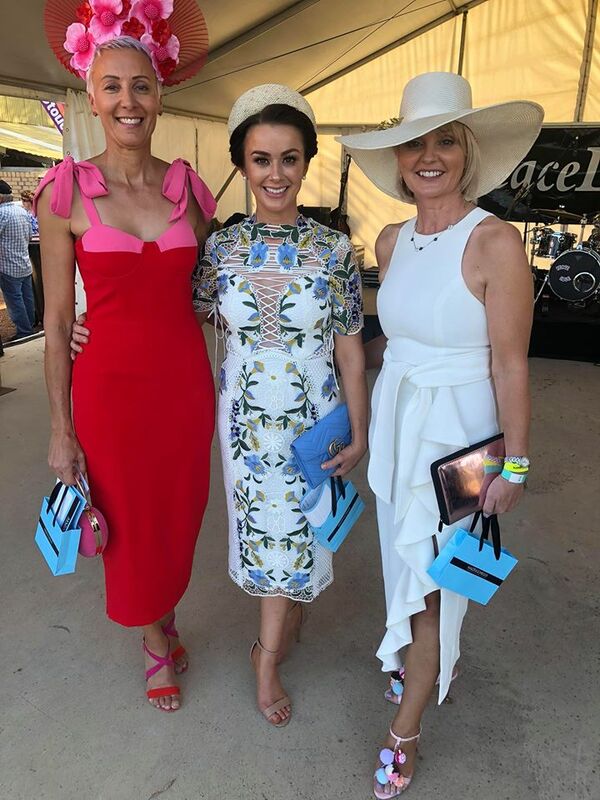 I brought said Daughter and lets say as much as a darling as she is I think race day will go back to being a Mummy only event as I didn’t get to hang out with my track friends and celebrate my first win as Best Dressed Female! woohoo! But I’m stoked she was there with me for the day and I loved sharing the day with her. The competition was fierce!!!!!!!!!!!!! 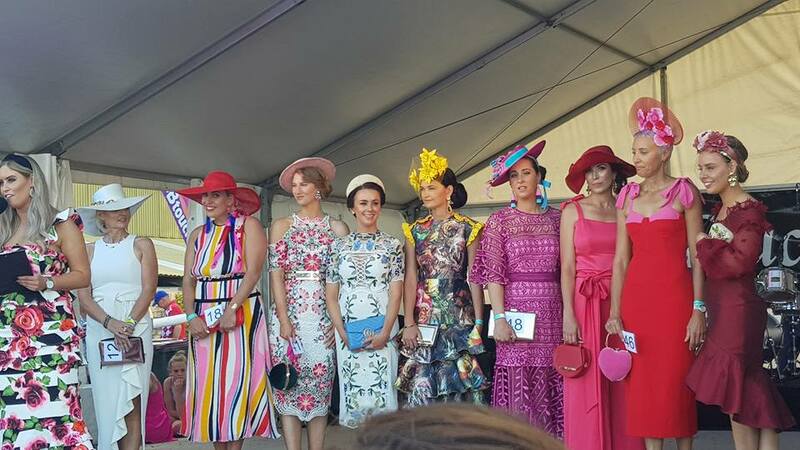 The level of the style, grooming and deportment was off the chart from the regular attendees and a few new faces were also there with stunning racewear, accessories and millinery. What a line up of bright and beautiful ladies!!!!!!!!!!!!!! Thurley, Only One Ashley, By Jonny and phenomenal new level millinery graced the stage. In a twist none of us knew was happening Julie Bishop Queen of the Universe made an appearance and lucky for me she gave me the $100 people’s choice award even though I wasn’t the crowd favourite but still thanks Julie (I put it towards a bottle of orange on the way home :))!!! Julie with the friendly locals looking stunning in this bone coloured leather dress. Go Lachy you cutie pie!!! !